3. Stopping the sentence- start a sentence with the REAL information and stop in the middle. Then change the sentence to create subtext. 4. Misinterpreting the subtext- allowing Joe to be misunderstood by another character. This can be successfully done by Jill misreading Joe's body language. Joe turns his head away because he doesn’t want her to see him tear up. Jill thinks he doesn’t care. 5. Talking about one thing, meaning another- instead of talking about his mother's death, for instance, Joe may instead talk about his favorite dog running away when he was a child. This gives him a chance to talk about the depth of his emotions instead of what really is bothering him. 6. Double entendre- easiest and most over-done. Can even be campy and will bring giggles and smirks. “Marriage is a fine institution, but I’m not ready for an institution.”Mae West. Body language is a perfect way to create subtext, especially when the words being said are in direct contrast. This would be a place for Joe to tell Jill he likes her when the reader can see his legs are crossed away from her and he won't look at her. WE know that he doesn't mean what he says. A good example of this is the interview with Brad Pitt and Angelina Jolie as they promoted the movie Mr. and Mrs. Smith. They had started their relationship during the filming but were denying all of it. The reason no one believed them? Jolie spent the entire interview flirting with Pitt. Her body language is a classic example of subtext - her mouth saying one thing when her body was saying quite another one. A teacher of memoir, beginning and advanced creative fiction writing, and screenwriting at Louisiana State University in Shreveport for over twelve years, she also teaches online for Margie Lawson at www.margielawson.com. 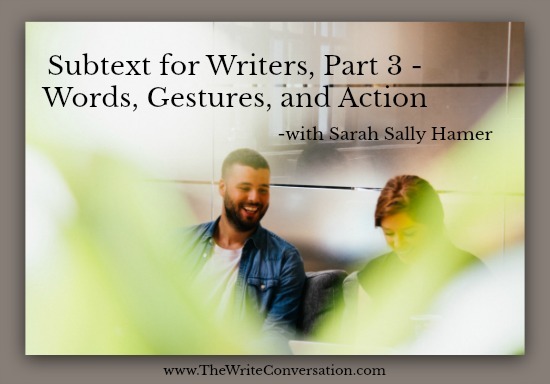 Sally is a freelance editor and book coach at Touch Not the Cat Books, with many of her students and clients becoming successful, award-winning authors. You can find her at www.sallyhamer.blogspot.com or on Twitter @sarahsallyhamer. Outstanding and informative! Thanks for sharing your wisdom. Thank you, my dear! I'm glad you're enjoying my posts. I am loving these series of post! Thanks, Sally, for sharing this information. Thanks, Ingmar! I always appreciate you chiming in.